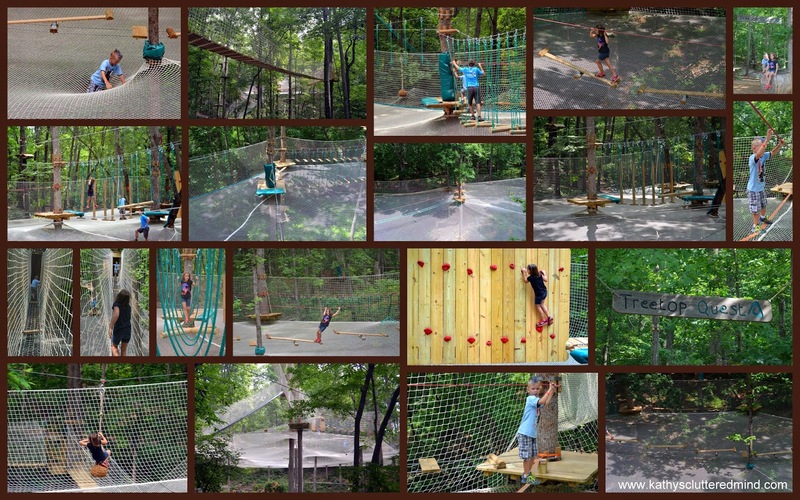 Spider Quest is the newest obstacle course at Treetop Quest in Gwinnett, Georgia. About a 2 weeks ago we got to give this new, one of a kind course a try and boy did we have a blast. Be sure to also read our previous Treetop Quest review too. Treetop Quest is located on the beautiful Gwinnett Environmental & Heritage Center campus and provides hours of fun for the entire family. 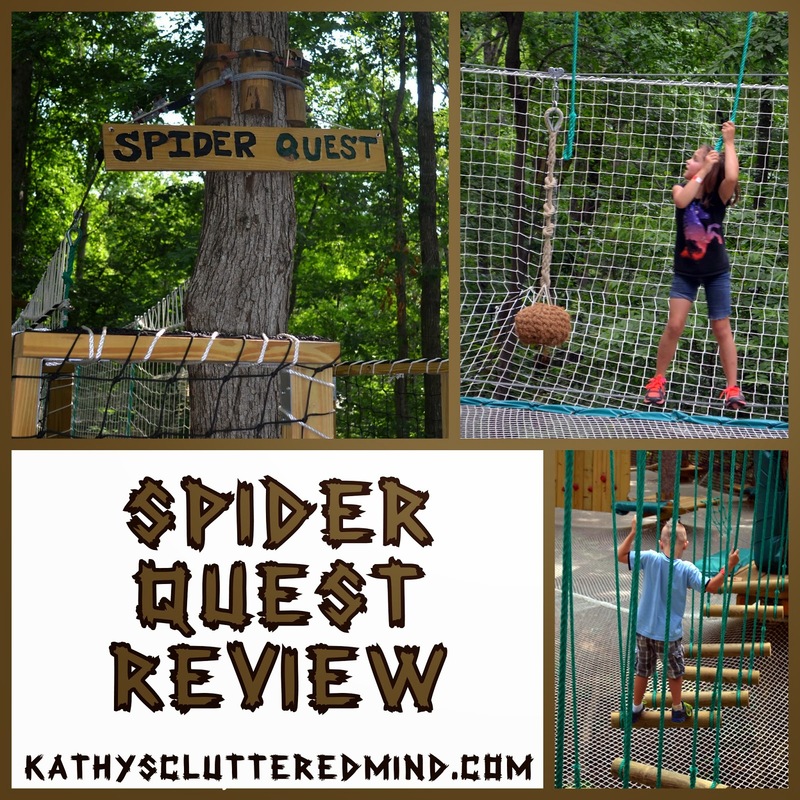 Since 2011 Treetop Quest has been entertaining adventurers with their 6 treetop obstacle and zip-line courses and now they have a NEW course Spider Quest. Spider Quest, is the FIRST ever of its kind in the USA. It is a harness-free treetop obstacle course above a giant safety net. It is a 1 hour activity with two obstacle course levels, 30 obstacle challenges, 2 tree-houses and a giant slide. The massive net covers 20,000 square feet. In order to participate in this obstacle course children must be able to reach 4'5" flat-footed with their hand. To get to the net obstacle course you will first have to make your way through a couple of mid-air swinging bridges and net walkways. My daughter ran through them and my son needed a little coaxing. But we finally made it to the Spider Quest net obstacle course. We were accompanied by an amazing staff member who gave the children a brief run down of the rules (like no jumping or walking around the net) and informed us of how to navigate the two different levels (red and green). As soon as our guide was done with his spiel my 8 year old adventure seeking daughter was off. I swear she was halfway through the course before my son and I even got started. She navigated each and every obstacle with confidence and precision. Even the most difficult obstacles were no match for her. During our visit she went through both levels several times. Some of her favorite obstacles were the cable-guided skateboard, giant slide, trapeze zip-line, teeter-totter bridge and rock wall. My 7 year old son who is a little less adventurous was a apprehensive about the course. But thanks to our amazing guide my son found his courage and by the end of our visit he had done all but maybe 4 of the obstacle challenges. Our guide encouraged and assisted him every step of the way. If there was an obstacle that my son really didn't want to attempt our guide would help walk him on the net to the next one. Rowyn moved a little slower through the obstacles than Gwyn, but by the end of our visit he had gone through most of the obstacles about 2 times each. Some of his favorite obstacles were the cable-guided skateboard, swinging logs and rope bridge. As for me, I had a blast too and got quite a workout. Seriously it's a lot harder than it looks! I went through each of the course levels once, the rest of the time I enjoyed watching, photographing, and encouraging the children. It was so much fun watching them use their bodies, imaginations and problem solving skills to accomplish the obstacles. And seeing my son become more confident with each and every step was really amazing too. My favorite obstacles were the giant slide, slack line and trapeze zip-line. If parents don't wish to participate they can observe from the canopy bridge or from the trails on the ground. So what about the giant net? Well if you happen to fall into it you will feel weightless and like you are walking on the moon. It's really cool! Gwyn didn't fall into the net at all, Rowyn fell twice and I fell once just to see what it was like. -Waivers must be signed before participating. To save time you can print and fill out in advance on their website (forms are on right sidebar). -They do allow cellphones and cameras to be taken up into the obstacle course however remember that it is a giant net and if you drop something it will fall below into the woods. -Spider Quest is a separate activity from the main treetop obstacles and zip lines. However, Spider Quest admission is discounted when purchased in addition to your Treetop Quest admission. -You may want to bring along a pair of gloves if you have sensitive hands. Treetop Quest may also have extra pairs you can borrow. -Large groups (schools, homeschools, companies, churches, sport organizations, etc) are welcome and discounts are available for groups. Birthday parties are also available. -If you are a really daring adventurer check out the Night Climbs for groups. With only a headlamp to provide you light you will traverse through over 70 obstacles in the dark forest. -Porter potties are onsite at Treetop Quest or there are traditional restrooms inside the Gwinnett Environmental & Heritage Center. -Light snacks and beverages are available for purchase or you can pack your own and eat them inside the covered pavilion at Treetop Quest. -If the park is not overly busy the staff may allow you more time on the courses. -Wear comfortable, lightweight, loose fitting clothing (loose fitting, comfortable) and appropriate closed toe footwear. -Warning you will see spiders, ants and other creepy crawlies on the obstacle courses. -Allow some time to walk the fabulous trails at Gwinnett Environmental & Heritage Center. There is a beautiful historical mill, geocaching and more! Buy your tickets online this Summer and $ave! Through June 27th use code WEEK4JUNE to save 20% off. Visit www.treetopquest.com/book-online/individual. Select 1. Book Treetop Quest OR 3. Book Spider Quest then enter code during check out. MUST purchase tickets online at least 24 hrs before selected date to receive the discount!